There’s no doubt that the sight of flowers is a delight to the eyes. They instantly generate feelings of warmth and create a sense of calm, thus becoming useful for when you’re feeling anxious. 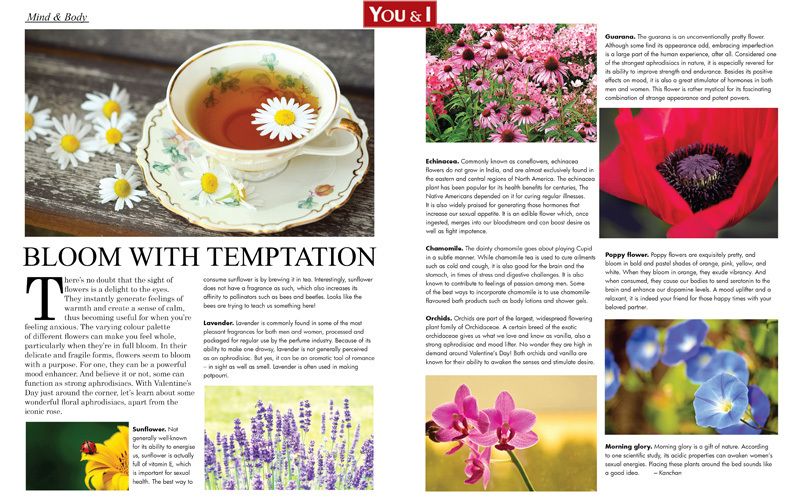 The varying colour palette of different flowers can make you feel whole, particularly when they’re in full bloom. In their delicate and fragile forms, flowers seem to bloom with a purpose. For one, they can be a powerful mood enhancer. And believe it or not, some can function as strong aphrodisiacs. With Valentine’s Day just around the corner, let’s learn about some wonderful floral aphrodisiacs, apart from the iconic rose. Sunflower. Not generally well-known for its ability to energise us, sunflower is actually full of vitamin E, which is important for sexual health. The best way to consume sunflower is by brewing it in tea. Interestingly, sunflower does not have a fragrance as such, which also increases its affinity to pollinators such as bees and beetles. Looks like the bees are trying to teach us something here! Lavender. Lavender is commonly found in some of the most pleasant fragrances for both men and women, processed and packaged for regular use by the perfume industry. Because of its ability to make one drowsy, lavender is not generally perceived as an aphrodisiac. But yes, it can be an aromatic tool of romance – in sight as well as smell. Lavender is often used in making potpourri. Echinacea. Commonly known as coneflowers, echinacea flowers do not grow in India, and are almost exclusively found in the eastern and central regions of North America. The echinacea plant has been popular for its health benefits for centuries, The Native Americans depended on it for curing regular illnesses. It is also widely praised for generating those hormones that increase our sexual appetite. It is an edible flower which, once ingested, merges into our bloodstream and can boost desire as well as fight impotence. Chamomile. The dainty chamomile goes about playing Cupid in a subtle manner. While chamomile tea is used to cure ailments such as cold and cough, it is also good for the brain and the stomach, in times of stress and digestive challenges. It is also known to contribute to feelings of passion among men. Some of the best ways to incorporate chamomile is to use chamomile-flavoured bath products such as body lotions and shower gels. Orchids. Orchids are part of the largest, widespread flowering plant family of Orchidaceae. A certain breed of the exotic orchidaceae gives us what we love and know as vanilla, also a strong aphrodisiac and mood lifter. No wonder they are high in demand around Valentine’s Day! Both orchids and vanilla are known for their ability to awaken the senses and stimulate desire. Guarana. The guarana is an unconventionally pretty flower. Although some find its appearance odd, embracing imperfection is a large part of the human experience, after all. Considered one of the strongest aphrodisiacs in nature, it is especially revered for its ability to improve strength and endurance. Besides its positive effects on mood, it is also a great stimulator of hormones in both men and women. This flower is rather mystical for its fascinating combination of strange appearance and potent powers. Poppy flower. Poppy flowers are exquisitely pretty, and bloom in bold and pastel shades of orange, pink, yellow, and white. When they bloom in orange, they exude vibrancy. And when consumed, they cause our bodies to send serotonin to the brain and enhance our dopamine levels. A mood uplifter and a relaxant, it is indeed your friend for those happy times with your beloved partner. Morning glory. Morning glory is a gift of nature. According to one scientific study, its acidic properties can awaken women’s sexual energies. Placing these plants around the bed sounds like a good idea.